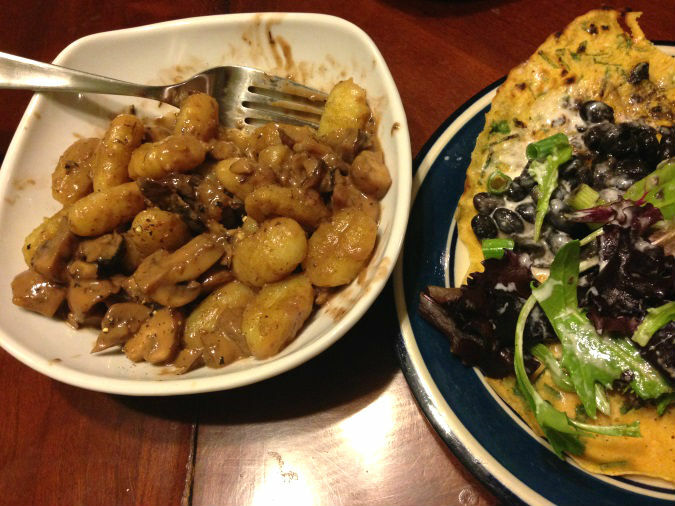 I set out this week to make this recipe for gnocchi with mushroom ragu — the meal was actually inspired by a package of gnocchi I got a killer deal on last week, so I used store-bought instead of the homemade version in that recipe. Homemade gnocchi always seems like an unnecessary pain. If I’m going to waste some calories on empty potato starch, it had better be becasue it makes for an easy weeknight meal and only takes 5 minutes to cook! I’ll save labor-intensive for if I ever decide to make my own fettucine. The recipe for the mushroom ragu is so dang simple I don’t really know what I can say about it. I bought a pound of delicious mushrooms at the Portland Fruit Company, sauteed them with butter and garlic and a teaspoon of homemade rub that was a Christmas gift from one of our friends this year, then added wine and stock (didn’t have any thyme), and a few teaspoons of corn starch to thicken it up. Then topped it off with some fresh lemon juice and cream! A pound of mushrooms really doesn’t make a whole lot of sauce once it cooks down — just enough to liberally cover two small servings of gnocchi, which was only about half the package — the rest will get turned into something else later in the week! Oh, but after cooking the gnocchi in boiling water and straining them, I did fry them up in some coconut oil on the stovetop so they were nice and toothy. This would never have been enough food for Jesse “I’m a growing boy” Hanson’s dinner, so fortunately I had pulled this recipe for chickpea crepes from my Pinterest to try out for this week. I would never think of crepes as being particularly filling, but since these are made entirely with chickpea flour, they actually packed a pretty filling punch and made for great little handheld shells in which to make mini DIY salad tacos. After whisking those together and letting it sit, I added more water until it was the consistency I wanted — like pancake batter. I heated up some coconut oil in our skillet and made these pancakes one ladle-ful at a time, letting them cook most of the way through on one side, then flipping them momentarily to finish them off. Our skillet has a pretty nice patina at this point so I didn’t have to re-oil the pan more than once or twice. 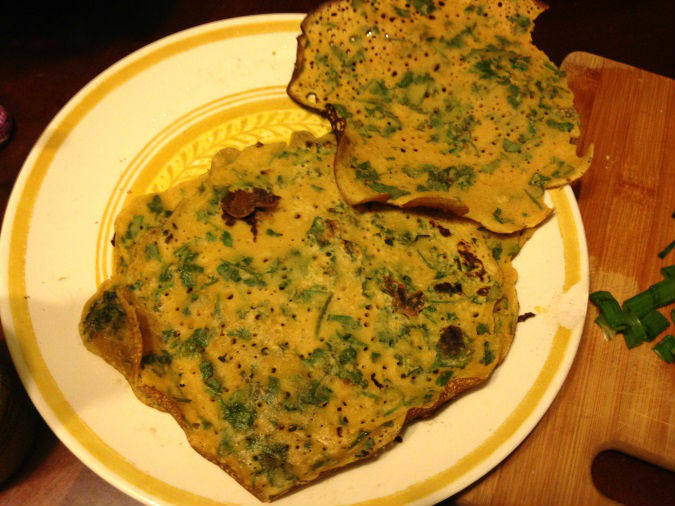 By the end, I had a big plate full of these protein-y, filling, spicy, savory crepes, which were served DIY-style, each of us adding our own ratio of salad greens, leftover black beans, green onions, and dressing (choices were lemon-tahini-yogurt, or garlic-dijon-vinaigrette) as the filling and eating them taco-style with our hands. Delish! This has got to be a sign. When I sat down Tuesday morning to eat my breakfast of a fried egg on a toasted English muffin with TJ’s eggplant spread and a kale-carrot salad, this was one of the many abandoned browser tabs I’d left open the week before, for perusing while I feasted (since one of my favorite things to do is read about food while I’m eating food). I had just realized about twenty minutes earlier that grocery shopping was one thing I could check off my list for this weekend, after tallying it up and realizing that I only have about $14 left for the rest of the month’s groceries. buttermilk: $1.99 — because I made this! Yum! No worries, though. If you’ll recall, I’ve got some food on hand that I can delve into, keeping the grocery runs to produce-only. Plus, last week I’d stocked up on some hearty, keep-well veggies that will easily last a week or two — things like a head of cauliflower, a bag of “Southern greens,” some fingerling potatoes, carrots, sunchokes, and a head of lettuce that are all still left in the fridge. And with a loaf of whole wheat rosemary herb bread rising as we speak, I know this means my lunches this week will be more sandwich-oriented (roasted eggplant and cheese! Egg and fresh lettuce! Tuna and nori! ), and my dinner simpler. Probably would have been the case anyway, given that this week not only do I have V-Day dinner with the girls, but am either hosting Knit Night or teaching a class all three weekday evenings. So when I started reading this recipe, and remembered that chickpeas are one of my favorite foods in the world, I jumped up and got some soaking right away. And then, I kept reading, only to discover that she recommends accompanying your chana masala with this cumin-bathed cauliflower and potato roast (which in my world, will be supplemented by sunchokes, a.k.a. potatoes with a little bit of an attitude). It’s like she was playing Iron Chef in my fridge or something. And then, I remembered that, for no particular reason, the night before I’d used the remaining tub of Greek yogurt in my fridge, that I had been worried would go bad, to make a big batch of cucumber raita. For real?? The universe is trying to tell me something, clearly. I’m going to spare you my recipe and just send you right over to Smitten Kitchen’s instead, because not only did I forget my camera at work this week and my iPhone shots of this culinary experiment are so woefully grainy and overexposed I can’t even bear to post them online, and because while trying to drag and drop a different photo in here (note to Bloggers: don’t do that), I lost the entire post I’d just written, and anyone who’s spent 45 minutes writing something and then lost it knows that round two always feels just a little bit bitter and despondent. Basically, both of these dishes are amazing, miraculously use up exactly the vegetables that I have lying around in my kitchen at the moment, and have already done a fine job of carrying me through my work week, and probably well into the weekend, without spending a dime on groceries this week.